Let’s look at a quick example. I want to run New-ADUser to create a user, and I want to populate a lot of information at creation time. I want to set a password. I want the account to be enabled after creation. I want to specify a specific OU in which to create the user. I want to include the user’s city and state. 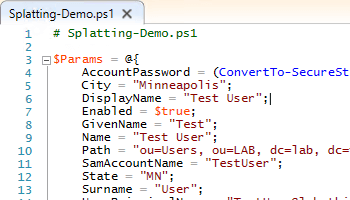 New-ADUser -Name "Test User" -GivenName "Test" -Surname "User" -DisplayName "Test User" -SamAccountName "TestUser" -UserPrincipalName "TestUser@lab.thinkpowershell.com" -AccountPassword (ConvertTo-SecureString "DemoPass1" -AsPlainText -Force) -Enabled $true -City "Minneapolis" -State "MN" -Path "ou=Users, ou=LAB, dc=lab, dc=thinkpowershell, dc=com"
I am guessing you had to scroll to look at it, and I am guessing that you found it annoying AND hard to get a clear picture of the user being created. That line is 355 characters wide! Now you might say “well, you could put some of those values into shorter variables names”, but even with short variables names you will run into situations where you exceed your screen width. Luckily, there is a better way! Splatting is a method of passing a collection of parameter values to a command as unit. Windows PowerShell associates each value in the collection with a command parameter. The benefit of using splatting is readability. Instead of having to stretch your parameter assignments out horizontally, Splatting gives us a clean, concise, readable format that extends vertically in which to assign values to our parameters. For the splatting variable, we can either use an array or a hash table. Let’s take a look. An array can be used if the cmdlet parameters are positional, meaning you don’t have to specify a parameter name. For example, let’s say you want to run Get-ChildItem for the file SecurityAndMaintenance_Error.png in C:\Windows\System32. To declare a splatting variable array, we can do it in the following format to keep it readable and vertical. Note that the variable is $Params and we use @(…) so we can stretch it vertically. Now to execute Get-ChildItem using this splatting variable, we run the following. Pay special attention to the fact we use @ instead of $ in front of the variable name Params. When we use @, we are actually referencing a named splatting variable, which will be treated differently. Arrays are supported for splatting, but if you are writing a script you want to follow best practices by using named parameters only, not positional parameters. Hash tables allow us to specify parameter names/values in a key/value format, which is why you should make it a habit to use hash tables by default for splatting. The width of this script block maxes out at 84 characters, compared to 355 when we spelled it all out on one line. That is 24% of the original width! And that, more (readability) or less (horizontal scrolling), is splatting! Read the about_Splatting article on docs.microsoft.com (in Reference below). Review your current scripts and implement splatting with hash tables where it will make your script easier to read. Nice explanation and useful. For complete info, it would be good to explain also use of back tick (` ) as it can be also used to splat vertically long commands. Thanks for the feedback. I have used the back tick as well, particularly when I am dealing with a long string, like a WMI query string or a filter. Though back ticks work they’re not the best for readability. I think the most useful thing about splatting is being able to build up parameters based on conditional logic in the calling script. Agreed that is a very useful benefit of splatting. I am planning a follow-up post to focus on that benefit.